Mr. Men party ideas and a chance to win the new book! I have always loved the Mr Men and it is lovely that middle man is such a big fan of them too. 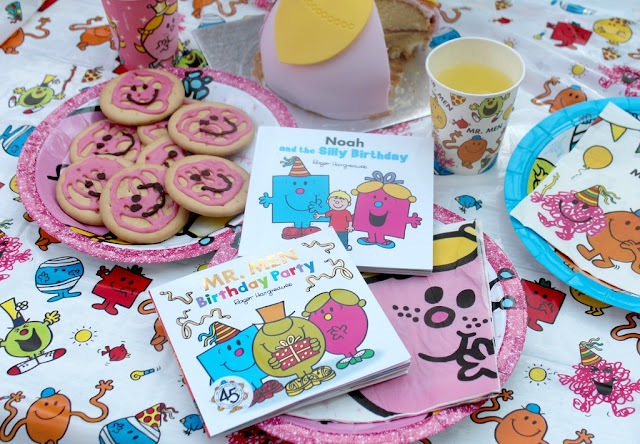 What better way to celebrate two more editions to his Mr. Men library, than to hold a Mr. Men Party! Little man and I prepared the party whilst middle man was at school. With a Little Miss Princess cake from Tesco and some easy to make Mr. Messy biscuits. Little man helped me make the biscuits and they can be as easy as you want. 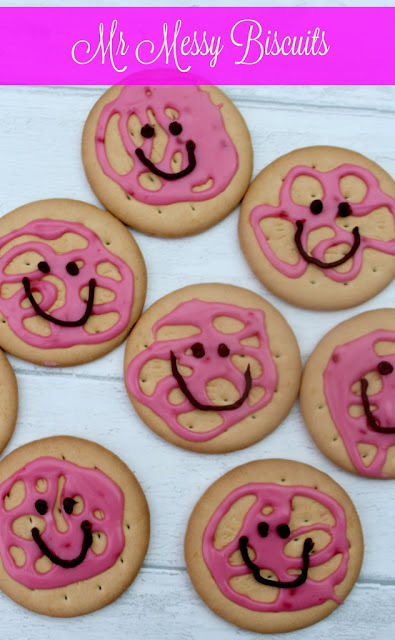 Personally, I like the easier option when it comes to party catering and instead of making my own cookies we decorated some rich tea biscuits. All we did was make some pink icing and place it in an icing bag. I didn't have any pink gel so I used some juice from some defrosted raspberries to get the intense pink colour. You then add a big squiggle to the biscuit using a piping bag. Let this icing dry before adding the eyes and smile. I used some Betty Crocker's fudge icing for this. Mix the pink paint with a generous amount of PVA glue. Cut the wool into long lengths, dip it in the paint mixture and then place on the white card in a Mr Messy shape. Allow to dry before adding foam eyes and a smile. Then use the wool to secure it around the body. 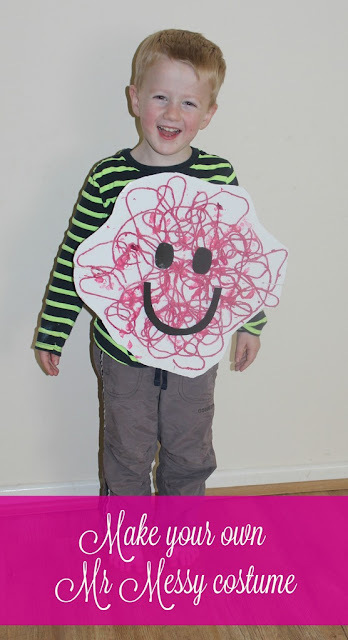 Here is my little Mr Messy! But why are we celebrating? 9th of May would have seen the creator of the Mr. Men, Roger Hargreves', Birthday. So Mr. Men Birthday Party is being released. I have to say that I really enjoyed this book. Mr. Birthday is ill and he is meant to be organising Mr. Silly's Birthday party. Little Miss Helpful tries to help, but things go astray and Mr Forgetful forgets to send the invites! Luckily more Mr. Men come to the rescue. You are now also able to personalise your own Mr Men book. Such a lovely idea for a Mr. Men fan. You get to choose the the features of the Birthday child, eg hair, skin tone and clothing. As well as this you can use the child's name and that of a friend in the story. Middle man was very excited to receive his own special copy. Your child is asked to help arrange a Birthday party but everything is a bit silly. Can you guess who the party is for? Mr. Men have some exciting giveaways to celebrate. If you love Pinterest then this Pin to win competition is for you. Full details can be found here, but you could win a Mr. Men party of your own! I am also excited to be able to offer a copy of The Mr. Men Birthday Party as a prize to one of my readers. Just complete the Gleam entry below. Good Luck! I will come back to this place, its huge and open, and have really tall ceilings. Wait staff was also pretty good. Bartender was awesome and personable. I was really pleased with home studios NYC. Ha! I highly recommend these guys.